Artisans in Indonesia handcraft this sculpture with hints of vacation flair (re: bright green flops). Ask this flamingo what time it is and he'll say, "It's 5 o'clock somewhere." That's just how the feathered friend rolls now that he's retired and living the yard life. Artisans in Indonesia craft this coastal bird from bamboo root, painting each by hand. Finished with a pair of green and brown sandals, the sculpture puts you in a vacation state of mind all year long. Place him in your garden or on a bar cart or deskanywhere that could use a touch of summertime. The design makes an adorable gift for animal lovers, recent retirees, or fans of coastal decor. Handmade in Indonesia. 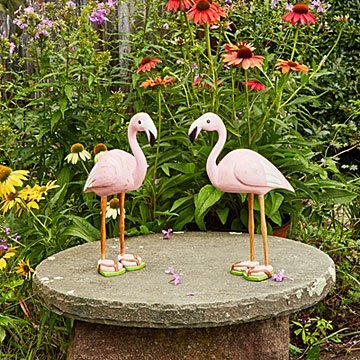 Due to the handmade nature of the item, each flamingo is unique and may vary from one to the other.